JN Bank’s first account holder! 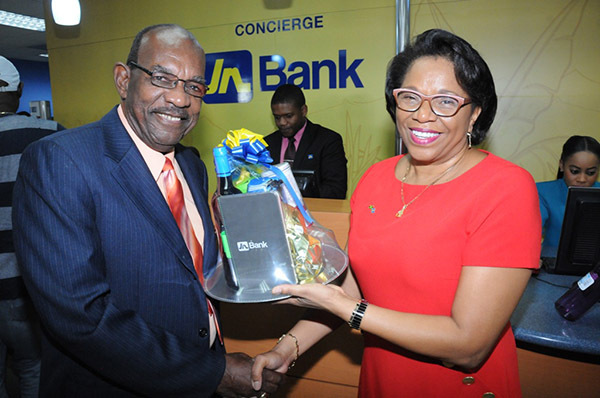 Percival Latouche (left), President of the Jamaica Association for the Resettlement of Returning Residents, receives a gift from Maureen Hayden-Cater, Managing Director, JN Bank, for being the first person to open a JN Bank account at the company’s Half-Way-Tree branch in St Andrew. JN Bank opened its doors to the public on Wednesday February 1, becoming the country’s first commercial bank to be fully owned by its savers and borrowers. Jamaica Association for Returning Residents © 2019. All Rights Reserved.